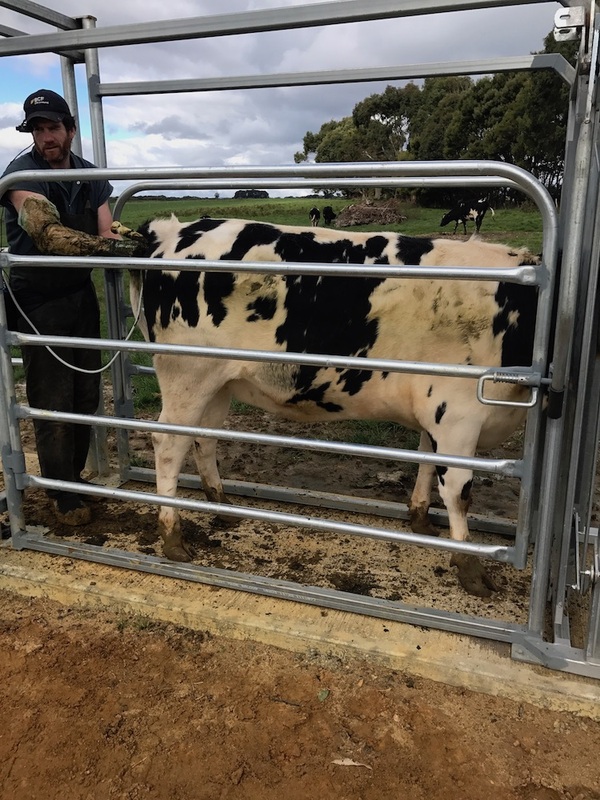 Welcome to the sixth instalment in our Dairy Life series, which follows the life of one of our dairy heifer calves, right through to her becoming a working milker. The health and wellbeing of our animals is critical to the quality of our milk and by extension the taste and success of our cheeses. Every decision we make on our farm is designed to produce the highest quality milk possible. This Dairy Life series aims to help our customers, and other people who aren’t farmers, better understand the intricacies of environmentally sustainable dairy production. It is a way of life that we love, but it’s also a highly demanding job that requires a good education, lots of training, extensive experience and the ability to understand and apply complex aspects of animal and agricultural science. So please enjoy Part 6 of the series and feel free to ask questions, make comments and interact with each other through the comments section of this blog. We are very excited to announce that Briney is in-calf and remains perfectly placed to join our herd this coming February. Six months ago we reported that Briney had been moved to Luke’s new property to continue her weight gain in preparation for joining with an Angus bull in late April. A couple of weeks ago, vets completed pregnancy testing on all 32 heifers in Briney’s group and every single one of them was found to be in-calf. This is a terrific result for our breeding program. Our heifers are preg-tested using ultrasound, which is less intrusive and more accurate. Briney and her mates were joined naturally with an Angus bull. She will be one of the first in her group to calf around February 4 – which makes her close to halfway through her 40-week gestation. She will turn two years old around the same time, which is normal. In the past 6 months she has gained, on average, 800g a day which is consistent with our planning and means she is now approximately 450kg. Our target weight for her when she calves is between 550-600kg. We check on her every 2-3 days and move the group into fresh pasture to ensure they have good natural nutrition – in addition to 1kg of grain each time we visit. The whole group is looking great. Briney was originally one of 33, but one of them died suddenly for an unknown reason. Unfortunately, this is a reality of farming. Crossing our maiden heifers (first time mums) with Angus bulls is a bit new for us. Traditionally we’d used jersey bulls, however because the calves from first-time mothers generally don’t play a role in the herd we decided to cross them with a beef breed instead. 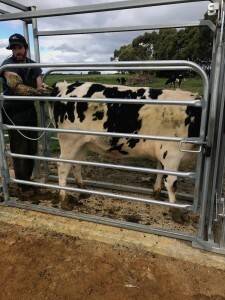 This means Briney’s calf will be an Angus-cross and will hold more monetary value for us which in turn means we will be able to either grow the calf ourselves for market, or sell the calf for another farmer to grow out. The beef market is very strong at the moment. 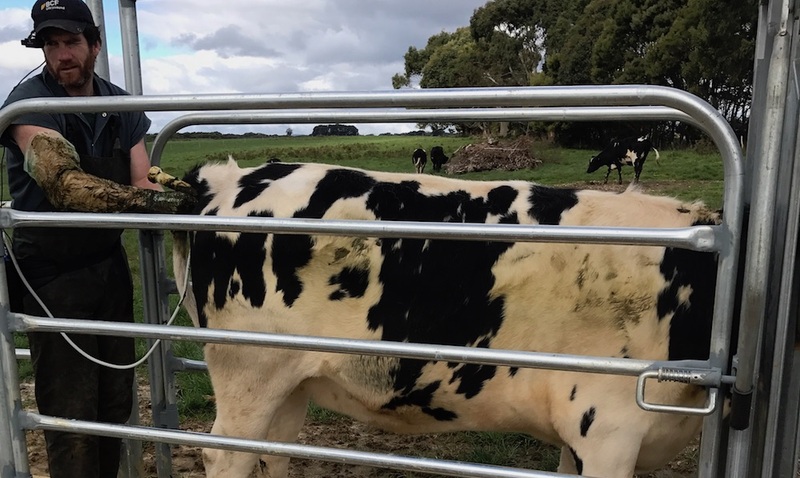 The next time Briney is covered, it will be with a dairy breed to hopefully produce a heifer calf that can also take the journey to join our herd – just as Briney is. Just last week, Briney and the rest of the group were freeze branded. 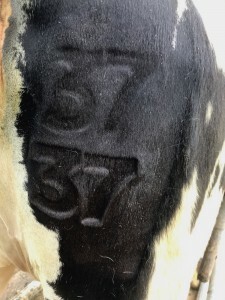 This process is used to duplicate her ear tag number, 3737, onto her hindquarter permanently. Contractors use a brand that has been in dry ice at -80 degrees Celsius. When the brand is placed on the hide, it kills the hair follicles. Within a month or two, those hairs will turn white and Briney will have an easily visible white number on her black hide. 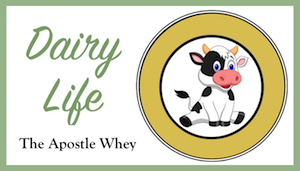 Early in the new year – about 4-6 weeks before calving – Briney will come back to our home farm to start dairy training right next door to the cheese shop. 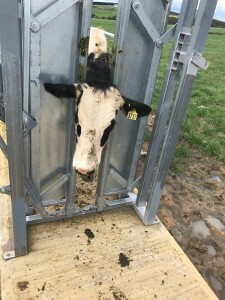 This will see her come in and out of the dairy and learn to step onto our rotary dairy where she’ll receive some feed and experience everything with the exception of actually being milked. 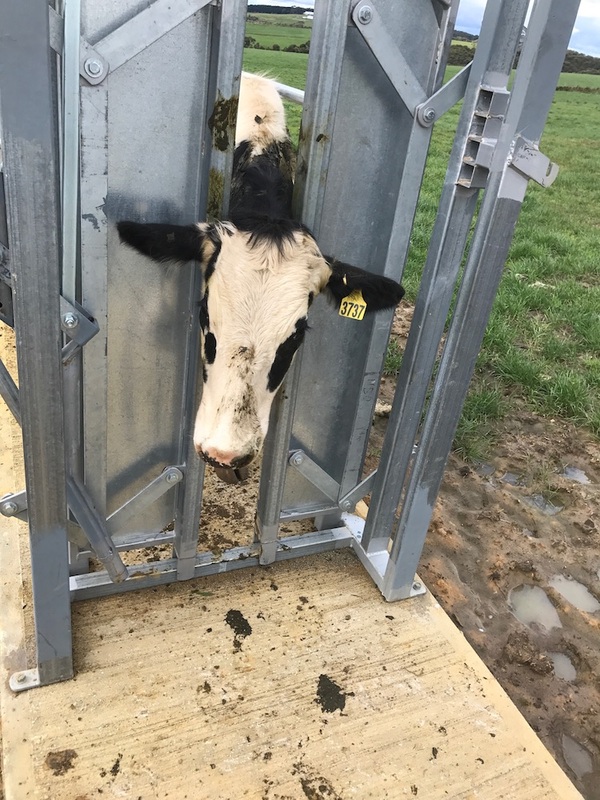 This process means our heifers get used to the dairy so that when they do calve and begin to produce milk they aren’t stressed about joining the herd and coming into the dairy. So for now, that’s where we leave Briney’s story. We’ll be sure to update you when she begins her dairy training and continues her journey to motherhood and becoming a working milker in our herd.